Are you going to vote for trustees who don’t believe in accountability/transparency? Why are they ignoring their own bylaw 263? 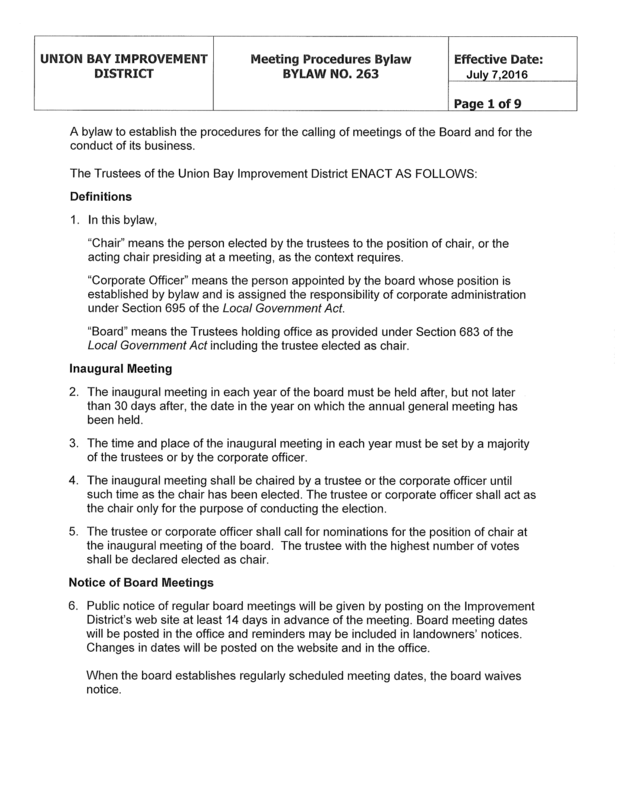 You would think they would at least attempt to abide by their own Meeting Procedures Bylaw 263 especially since it was created because the 2011 Board illegally locked out the electorate by passing a bylaw which the Ombudsperson’s office instructed the board to amend. That bylaw was repealed July 18, 2012 and replaced. The two trustees up for election don’t deserve your vote. They snub their noses at bylaws, making up their own rules and want to do everything behind closed doors. These guys really screw around with the bylaws. One meeting they are touting how important it is to abide by the bylaws and then they turn around and completely ignore the bylaws. 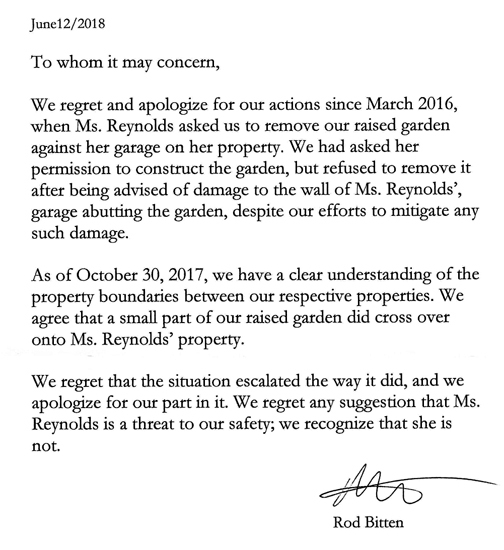 Although to be fair they probably are ignorant of the bylaws because they display their lack of understanding every time a bylaw is discussed. 1) A meeting of a council must be open to the public, except as provided in this Division. 2) A council must not vote on the reading or adoption of a bylaw when its meeting is closed to the public. Please advise that you are, from this point forward, reopening the public meetings so all who want to attend can. UBID is a very small local government and taking 5 days to respond is not unreasonable. Under the local government act a Improvement District is only required to have one meeting annually open to the public. Th annual general meeting will be open to the public, I have confirmed this point with legal counsel and the ministry. You will note that under the Meeting Procedure 686 (1) An improvement district board must, by bylaw, do the following: (emphasis added by me). 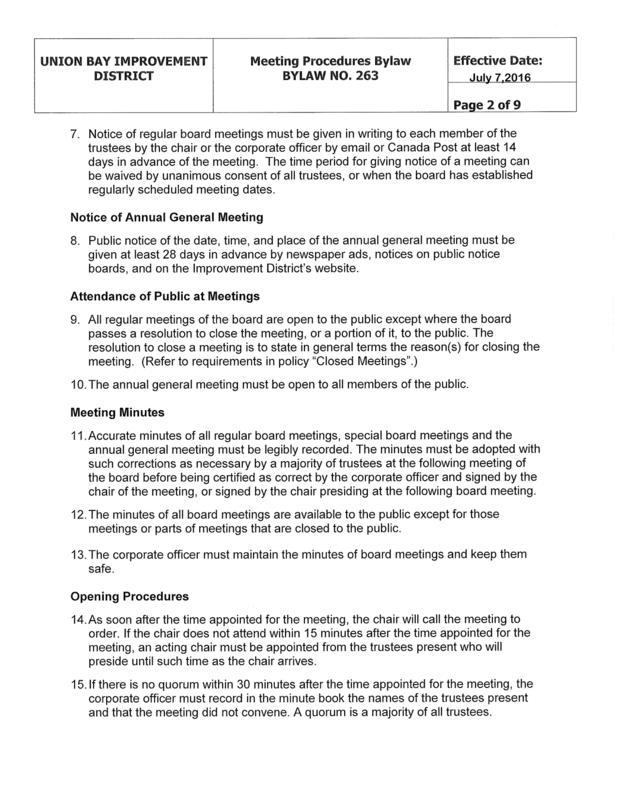 (a) establish the procedures that are to be followed for the calling of meetings of the board and for the conductor its business, including the manner by…. This was done and the bylaw 263 Meeting Procedures is in effect. See below. So why did the admin ignore this important point when he advised the individual “a Improvement District is only required to have one meeting annually open to the public.”? The bylaw clearly has laid out the meeting procedures in compliance with S.686 section of the Local Government Act. 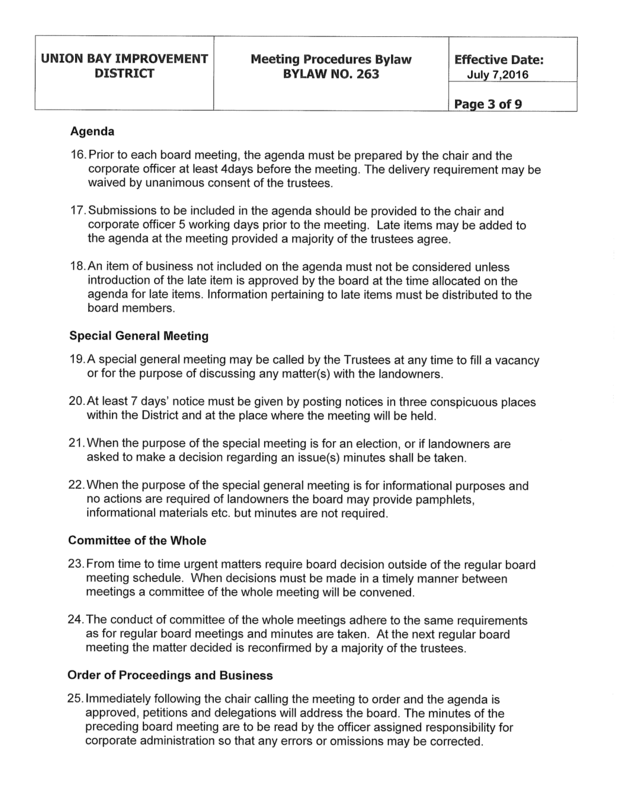 S. 690 states at least once in every 12 months, an improvement district board must call a meeting of the owners of land… This meeting isn’t intended to replace all meetings in the 12 month period. How could a board carry out business or pass bylaws if it was all done in secret? All business done in camera or executive meetings have to be brought to a public meeting to pass. If there are no public meetings ?????? 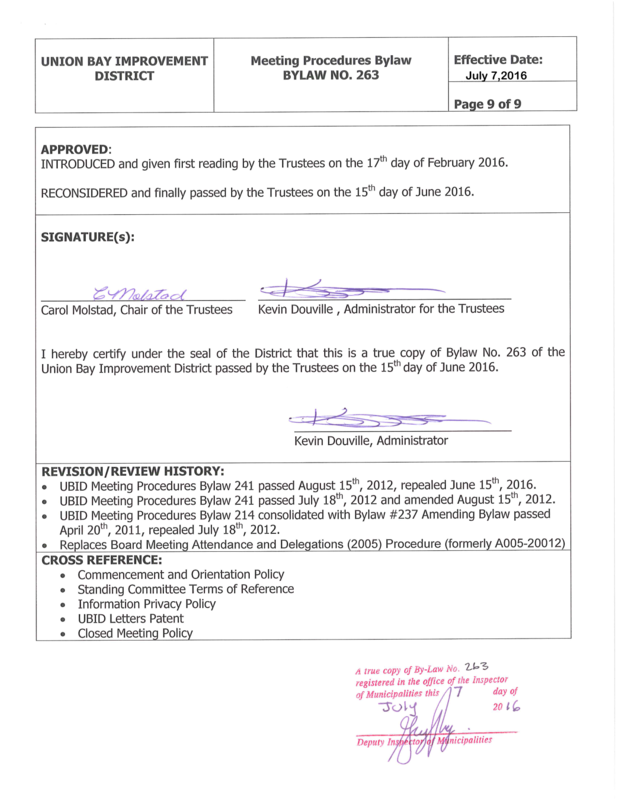 Trustee Kaljur was intentionally refused notice of each meeting by this Admin – This guy needs to be replaced immediately before more damage is done to democracy in Union Bay. If he confirmed this point with counsel and the Ministry – then I’m sure Trustee Kaljur will be forwarded this information – right? Next Post Who is providing legal advice to UBID Trustees? They spout off nonsense. No due diligence from the remedial UBID board. Without transparency there is no accountability. Don’t people understand that democracy is more than the “majority “ rules. It’s about doing what is right; to ensure all people have an opportunity to understand and voice their opinion. This board seems to think that they have right to do as they seee fit with no regard for the ratepayers. I will be only paying $10 as the first instalment of my parcel tax untill this board has shown me they deserve my money! !